One story a day : Reliving childhood: Morning Mania! Once your kids start school, weekday mornings turn crazy! As it is, weekday mornings are a rush, but the added pressure of getting your little one ready just in time for the school bus leaves you exhausted even before you’ve begun your day! Of course, with schools situated at distances that you dread having to drive yourself, you cannot afford to have your kids miss the school bus! So mornings are always a struggle - when your threshold is running low and your little one launches a go-slow; when every minute counts as your tension mounts; when you don the role of a motivational speaker to get your little dreamer to hurry when you are in a hurry too! Mornings are no different in our house where the morning raaga played is a fusion of Abhay’s whining and my nagging…yelling…..pleading (in that same order!). Finally it feels as if the whole house heaves a sigh of relief as Abhay reaches his pick up in the nick of time to catch his school bus! 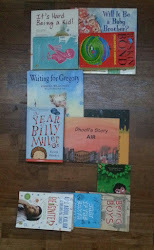 So today we read about another family who might just miss the bus when it pulls up at their doorstep. “Catch the Bus” a Level 2 Early Reader Berenstain Bears story that doubles up as a Tell the time story. Its 6.59 AM and all is still at the Berenstain Bear’s tree house and Brother and Sister Bear are seen fast asleep in their room. At 7.00 AM as the alarm goes off, both the bear cubs decide to snooze on and are soon back to sleep. At 7.15 AM, the school bus starts off to pick up the cubs one by one. The school bus is on its way to pick up Brother and Sister who are sound asleep in their beds. At 7.45 AM, Mother bear worries that her cubs will miss the bus if they don’t hurry. At 7.50 AM, the cubs are woken up by an angry mother who rushes them through their morning routine of wash and dress, comb and brush and breakfast in a hurry …and off they scurry to catch their bus just in time as it arrives at 8 0’clock! The story ends with a verse that echos my sentiments in the morning - "If you sleep past seven, you might be late when the school bus comes for you at eight!" I hear you! Sounds like just the scene at my home on school mornings!